At the entrance of the Green Mountains Nature Reserve in Sutton, the Nature Conservancy of Canada (NCC) has protected 740 acres (299 hectares) of ecologically sensitive lands. Adjacent to the Mont SUTTON ski resort, the newly acquired property is accessible to the public at all times, through walking trails maintained by Parc d’environnement naturel de Sutton. Located in the Eastern Townships close to Montreal, the property covers the Dos d’Orignal and the northwest side of Mount Gagnon. There are 18 streams that flows through the property. They provide an important reserve of crystal clear water, key to the survival of spring salamander, an at-risk species. Two other species at-risk species on the Species at Risk Act live here: Bicknell’s thrush in the dense, high-altitude fir stands, and Canada warbler, found in mixed forest with heavy brush. The site also provides habitat for wide-ranging mammals such as moose and fisher. It also features a rich old-growth forest. This site, with its incomparable view, will remain in excellent condition and free from development. The property adds to the Green Mountains Nature Reserve, which currently covers 17,300 acres (7,001 hectares). Protecting this area for the long term will ensure the protection of spectacular views, such as those on the Dos d’Orignal loop. 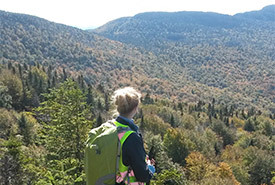 Appalachian Corridor, Parc d’environnement naturel de Sutton and Les Sentiers de l’Estrie have worked jointly with NCC to carry out this project and raise funds. Interested members of the public are invited to contribute online at www.natureconservancy.ca/sutton-donate. Additional funds will help complete the financial plan and to enhance this great forest property by maintaining and improving the current network of trails. NCC has raised funds thanks to the generous donations of various local residents and stakeholders, as well as foundations, government agencies and conservation organizations and the governments of Quebec, Canada and United States. They all put their shoulders to the wheel to achieve this important conservation project! And others wishing to remain anonymous.